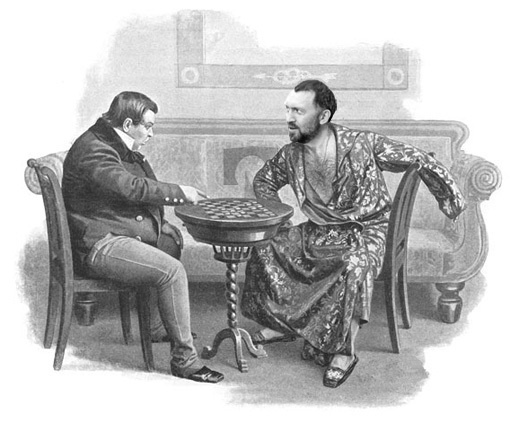 In Gogol’s well-known story Dead Souls, Chichikov (left), the central character and villain of the piece, makes a lucrative business of buying the names of dead serfs from local census rolls in order to cut the tax liabilities of landowners, accumulate fake collateral against which he intends to borrow, and then retire in wealth. In the more up to date case of the state-funded aluminium monopoly, United Company Rusal, the business is to keep filling the names on the employment rolls while disposing of their jobs and eliminating the unsellable surplus of their production. The idea of Oleg Deripaska (right), Rusal’s chief executive and trustee for the state owners of the company, is that if the souls protest their loss of work and income, they won’t be convincing to the Kremlin so long as Rusal claims to be paying them for work no longer done. Rusal’s published rationale for what is happening is that until international demand for aluminium raises the price of the metal in trade, it must cut supply to the market. That’s problematic because of the large accumulation of unsold aluminium in uncounted warehouse inventories. That story can be read here. Rusal says it must also close down its high-cost production plants in western Russia; and open new plants in Siberia where electricity and other costs are much lower. On the other hand, according to the company’s employment and payroll figures released last month, as of June 30, 2013, there were 24,688 employees in the aluminium division, compared with 21,147 the year earlier, on June 30, 2012 – a gain of 16.8%. Over the same interval, according to this report, production of aluminium fell by 4.5% to 1.999 million tonnes. The apparent contradiction between more souls producing less aluminium is explained by the fact that the names on the Rusal employment rolls aren’t the same. Those losing jobs in one part of the country aren’t the same as those gaining jobs in the east. The social and political consequences of this scheme in Russia are about to be tested. Over the past six months the former owner of the Krasnoyarsk Aluminium Plant (KrAZ), Anatoly Bykov, has been campaigning to win a plurality of seats in the city council of Krasonyarsk, a city of almost a million souls. On Sunday, he was victorious. At the September 8 election, Bykov and his party, Patriots of Russia, won 13 seats, defeating the pro-government party, United Russia. Although the city voter turnout was a record low of just 18.6%, Bykov has now built a new power base in Krasnoyarsk, moving from a seat in the region’s legislative assembly to control of the city council. With production of 1 million tonnes (2012) KrAZ is the second largest smelter in the Rusal group and the second largest (after Rusal Bratsk) in the world. On current output results, KrAZ leads Bratsk (BrAZ), turning out about one-quarter of the aluminium produced in Russia. In 2000 Bykov and other KrAZ and BrAZ shareholders were forced by a combination of political and physical standover tactics to sell out to Roman Abramovich and Oleg Deripaska. The details were spelled out by several witnesses in the UK High Court during Boris Berezovsky’s lawsuit against Abramovich. Bykov was a tough guy, but not strong enough to resist then. Here is that story. Bykov was a sworn enemy of Deripaska’s before he was ousted from KrAZ (and BrAZ). In the years that followed, Bykov was the target of criminal charges, including an allegation of murder for which he was arrested in Hungary, extradited to Russia, and imprisoned for a time, before the charges were dismissed at trial. Bykov also successfully sued Deripaska in Switzerland for $100.5 million in unpaid aluminium sales revenues. Deripaska bought out Abramovich, but it is no longer possible to say he owns KrAZ. For the plant’s fixed assets and also its shares have been pledged to secure Rusal’s borrowings from the state banks. The small print report in the loans and borrowings section of Rusal’s latest financial report, issued on August 19, reveals that “an additional 25% plus 1 share of Rusal Krasnoyarsk… has been pledged as collateral under the loan agreement with Gazprombank”. This report doesn’t reveal how much of the remainder of the KrAZ shares is already pledged for other loans, including Rusal’s debt to Sberbank. Adding the collateral up, it looks like the majority shareholders of KrAZ are the state banks. The state also dictates the cost of electricity on which the plant depends, plus the freight tariffs charged by the state railway system for carrying raw materials into the smelter and metal out. The state and regional budgets, and ordinary taxpayers, are footing much of the bill on the cost side of Rusal’s balance-sheet. Bykov and other critics of the way KrAZ is managed will make their case that Deripaska is taking for himself more than a fair share of the revenue side of the Rusal balance-sheet, the cashflow of KrAZ, and its underlying profitability in the Rusal group. The argument is that the KrAZ workers are paying Deripaska more than he is paying them. One sign of how fearsome this argument is at Rusal headquarters is the effort the company’s lawyers are making to suppress all media reporting of what’s happening in Krasnoyarsk. According to records of the Krasnoyarsk Arbitrazh Court, since March of this year Deripaska and Rusal have directed lawyers to sue Victor Isaev, director of the Krasnoyarsk Independent Information Agency for defamation of character. The alleged libel is the claim on Isaev’s website, that “Oleg Deripaska refuses to pay taxes , not only in Russia, but also in Guinea.” This was published almost two years earlier, on October 20, 2011. Deripaska’s lawyers say the publication is false. Other Krasnoyarsk reporters and publishers say the case has been trumped up to deter sensitive reporting on KrAZ or Rusal. Isaev says he has not been following job cuts and personnel layoffs at the plant. Another source says there are many rumours about job cuts. If the number of cuts is less than one hundred, the source claims, the number can be concealed. According to Yeliseyenko, there is more concern in the region about repeated delays in completing Rusal’s planned new smelter, the Boguchansk aluminium smelter (BoAZ), aka Boguchansk Energy and Metals Complex (BEMO). “At first it was going to start in the first quarter of 2012, then in early 2013, then postponed to the end of this year, and now it appears that the inputs are planned in the first quarter of 2014.” A Rusal presentation in April 2011 claimed the new smelter would have capacity to turn out 600,000 tonnes of aluminium per year, employing 3,000. Rusal reports fail to say how many, or how few of these jobs have materialized. Rusal documents indicate that half the equity in BoAZ is owned by the state through its power company, RusHydro. VEB and Sberbank have held BoAZ shares as security for the loans financing the construction of the plant, and the supporting infrastructure. Rusal’s latest financial and production reports indicate in the first six months of this year just 94,000 tonnes of aluminium were cut from the output tally. To June 30 the company says it produced 1,999,000 tonnes, 4% less than in the same period of 2012. In March Rusal said it was aiming to cut 300,000 tonnes of metal output for this year. On August 19, it set a new target to cut of 357,000 tonnes. The company’s half-year report, also issued on August 19, says the target for this year is to cut a total of 9% of output; that means another 263,000 tonnes by December 31. “The updated program,” says Rusal, “will see production halted at a number of the least efficient smelters in the Aluminium division West as well as at certain smelters in Siberia. Production is forecast to be reduced by 357 thousand tonnes (or by 9%) in 2013 vs 2012. Full effect of the program will be reflected in 2014.” Nothing is disclosed about the job cuts which would follow from the production losses. The smelters targeted for the cuts are Bogoslovsk, Volgograd and Nadvoitsk west of the Urals; Uralsk and Novokuznetsk in Siberia. The bottom-line on the balance-sheet was still loss-making. The after-tax loss for the first half was $439 million; a year ago, by comparison, the company reported a net profit of $1 million. Public opposition in the smelter towns is growing from plant workers, local unions, district, city and regional administration officials, and party politicians. Those opposed to Rusal are reluctant to speak their minds. Local government departments responsible for monitoring unemployment claim not to have data on layoffs. Rusal’s reports are difficult to interpret. In its latest breakdown of costs of sales, Rusal reports that cost of bauxite and alumina which other Rusal units supply amounts to 18.8% of the cost aggregate. The cost of other raw materials (petroleum coke, fuel oil, anodes) supplied to the smelters makes another 34.4%. Rusal’s consolidated financial reporting makes it impossible to calculate how much of this cost is profit accumulated elsewhere in the Rusal group, or taken by Rusal’s shareholder and principal trader, Glencore. Whether Glencore’s profit-taking at Rusal’s expense is lawful, or a violation of the company’s shareholder agreements, is being tested behind closed doors at the London Court of International Arbitration where Victor Vekselberg and SUAL Partners are suing Deripaska. The public campaigns to fight Rusal’s job cuts have yet to focus on the company’s offshore trade accounts, let alone on the highly secret Glencore operations. In its breakdown of sales revenues, Rusal’s report doesn’t name Glencore, but its share of sales appears to be in the line items for “related parties”. Altogether, these “parties” account for 47.3% of aluminium sales; 32.9% of bauxite and alumina sales. To combat the job cut criticism during the recent regional and municipal election campaigns, Rusal sponsored candidates of its own. Not all of them are recognizable; not all of them were elected.